Copyright, 1898, by Albert Loraine & Co. Words and Music by Thomas E. Powers. Faith, Murphy loves his darling wife, Johanna loves her Mike. Thirteen little Murphys eating pig's head pie. Murphy and Johanna drinking rock and rye. He keeps a blanket on this horse, as thro' the streets they go. To stop the wind from blowing hay out of the horse, ho, ho. 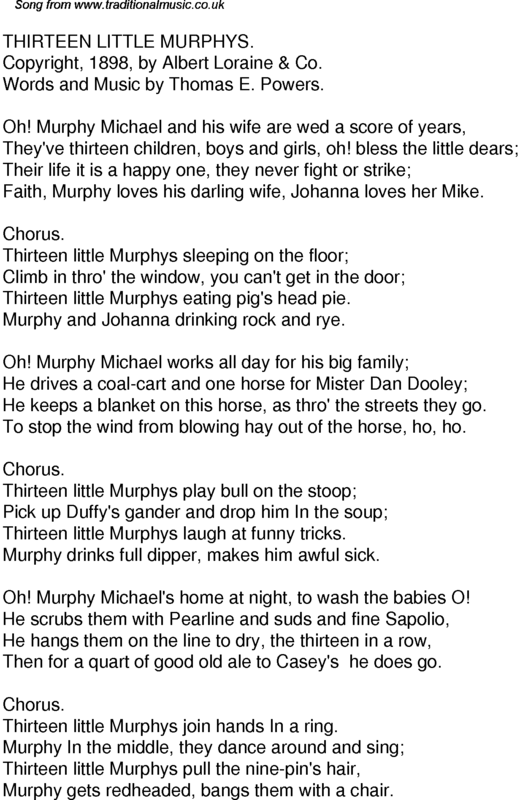 Thirteen little Murphys laugh at funny tricks. Murphy drinks full dipper, makes him awful sick. Oh! Murphy Michael's home at night, to wash the babies O! Then for a quart of good old ale to Casey's he does go. Thirteen little Murphys join hands In a ring. Murphy gets redheaded, bangs them with a chair.